Summer is beginning to fade, and it’s time to get the kids ready for school. However, it is also time to think about your pets. After a couple of months with 24/7 attention from the kids and possibly a family vacation or two, your pets might be feeling a little alone and upset. Sudden changes in the family schedule can be challenging for companion pets, in particular cats and dogs. Both cats and dogs can suffer from depression and anxiety when their humans suddenly disappear from daily life. Your South Coast veterinarian can help you with ideas to make this transition more comfortable for your pet. New Bedford pet owners and pet owners throughout the Southeastern Massachusetts and Rhode Island area should consider a check-up at Anchor Animal Hospital in Dartmouth if anxiety, depression, or behavior issues become a problem. You might not realize this, but separation anxiety is a real issue for many pets. 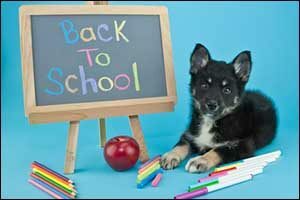 Dogs and cats are both at-risk for back to school issues. Some of the symptoms include excessive howling, whining, and barking; destructive chewing; potty-training relapses; attempts to escape; and a sudden change in mood or behavior. Any significant family routine change can cause separation anxiety, even in a dog or cat that never experienced this type of challenge in the past. As our pets get older, they can become more dependent on us. After three months of everyone being at home, hanging out, playing outdoors, and not having to get up and go away in the morning, your pet might not react in the way that you would expect. However, pets who have a history of trauma, abuse, neglect, or abandonment, such as pets that were rescued from a local shelter or passed between multiple owners, will experience separation anxiety at a much greater degree. This is especially true if the strong bond is with a child who has to go away to school for several hours each day. Cats are just as susceptible as dogs; however, there’s not a lot of information available for pet owners who are dealing with this issue. New Bedford pet owners who have a cat that is withdrawing, hiding, trying to escape, or has changes in appetite, use of litter box, and upset stomach, should seek professional advice. Bring your cat to the local emergency veterinary hospital right away or call a trusted vet to schedule an immediate appointment. In addition to separation anxiety, boredom, and destructive behaviors, there are other dangers that lurk in many homes during this time of year. School supplies, new shoes, new clothes, backpacks, lunches, and after-school snacks are all par for the course with most students. Many of the school supplies that we purchase could be toxic or harmful to pets. Even labels that say “non-toxic” are designed for children and not as an all-clear for cats and dogs. Colored pencils, crayons, markers, glue sticks, and spiral notebooks can all be dangerous in many ways, posing a choking hazard or a toxic material, depending on the type and brand that has been purchased. New shoes come with the “packing gel” in the little bags that are toxic for both dogs and people. Many new clothes, such as winter jackets, boots, and other apparel, may also contain small bags of packing gel. It should be removed and thrown out in the outdoor trash right away to prevent pets from accessing it in the household trash bin. School lunch and snack ingredients can also be harmful to pets. They often come in shiny, crinkly wrappers that get the attention of your pet just as much as they do your kids. Chocolate can be very dangerous to pets if consumed, so New Bedford pet owners should be careful with where these items are stored inside the home. Backpacks, plastic bags, and lunch bags should also be stored up and away from the reach of pets to prevent choking or other injuries. For more tips from your local South Coast veterinarian, visit our blog for year-round tips that you can use to keep your pets healthy, happy, and safe. Anchor Animal Hospital in Dartmouth provides veterinary check-up and emergency veterinary hospital services to New Bedford pet owners and pet owners throughout the Southeastern Massachusetts, Cape Cod, and Rhode Island area. To learn more about our services or to schedule an appointment, give us a call at 508-996-3731 and speak with one of our friendly team members.